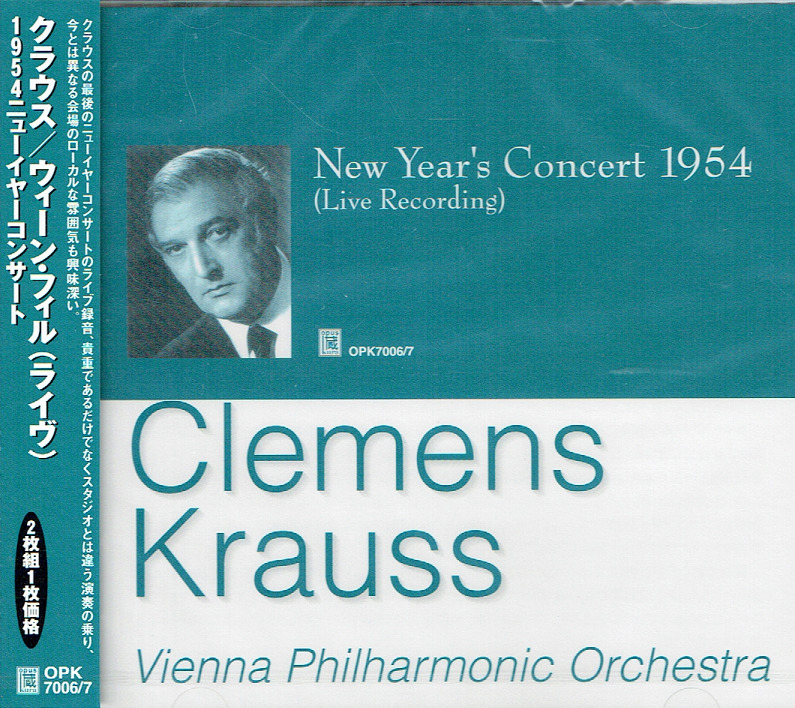 "The Viennese conductor Clemens Krauss was one of the three great Classicists who died relatively young in the early 1950s: the others were Fritz Busch and Erich Kleiber. It has been said that Krauss made few records, but in truth a reasonable representation of his art was captured for posterity. He first recorded in July 1929, with the Vienna Philharmonic, and his series of 78 rpm discs with the orchestra still sound exceptional. 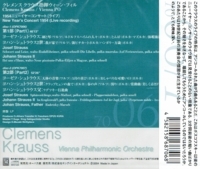 For this CD, Opus Kura has selected two examples of his art. The 1950 performance with the Vienna Symphony Orchestra of the incidental music to 'A Midsmmer Night's Dream' is Krauss' sole record of music by Mendelssohn. In this performance, the music really comes alive, as you will hear. Schubert's 'Unfinished' Symphony was performed in April, 1951, with the orchestra of the old German Opera House in Prague, which found a new home in Bamberg after the war." "Clemens Heinrich Krauss was a leading Austrian conductor, particularly associated with the music of Richard Strauss, who got to his major positions by the resignation of conductors less sympathetic to the German Nazi regime. His mother was Clementine Krauss, a leading Viennese actress and singer. He was also related to Gabrielle Krauss (1842 - 1904), an important nineteenth century soprano. His father was a figure in the Austrian Imperial Court. When Clemens went into music, he used his mother's name because of its theatrical history. He made the rounds of regional centers, conducting in Riga (1913 - 1914), Nuremberg (1915), and Sczeczin (1916 - 1921). The latter appointment gave him ample opportunity to travel to Berlin to hear Artur Nikisch conduct the Philharmonic, a major influence. His next appointment was back in Austria, where he became director of the opera and symphony concerts in Graz. In 1922 he joined the conducting staff of the Vienna State Opera and teacher of the conducting class at the State Academy of Germany. In 1923 he became conductor of the Vienna Tonkunstler Concerts (until 1927), and Intendant of the opera in Frankfurt am Maine and director of the Museum Concerts in 1924, until 1929. He visited the United States in 1929, conducting in Philadelphia and at the New York Philharmonic. Also in 1929 he was appointed director of the Vienna State Opera. Its orchestra, in its independent concert form as the Vienna Philharmonic, appointed him its music director in 1930. He was a regular conductor at the Salzburg Festival from 1926 to 1934. In 1933 and 1934 he gave up his Vienna positions, becoming director of the Berlin State Opera in 1935 after Erich Kleiber resigned in protest over Nazi rule. Leaving Austria for Nazi Germany was no hardship for Krauss, who was a friend of both Hitler and Goring. In 1933 he took over the preparations for the premieres of Strauss' opera ARABELLA when the principled conductor Fritz Busch left. In 1937 he was appointed Intendant of the Munich National Theater, following the resignation there of Knappertsbusch. He became a close friend of Richard Strauss, wrote the libretto to the opera CAPRICCIO (which he premiered in Munich in 1942), and DER LIEBE DER DANAE. 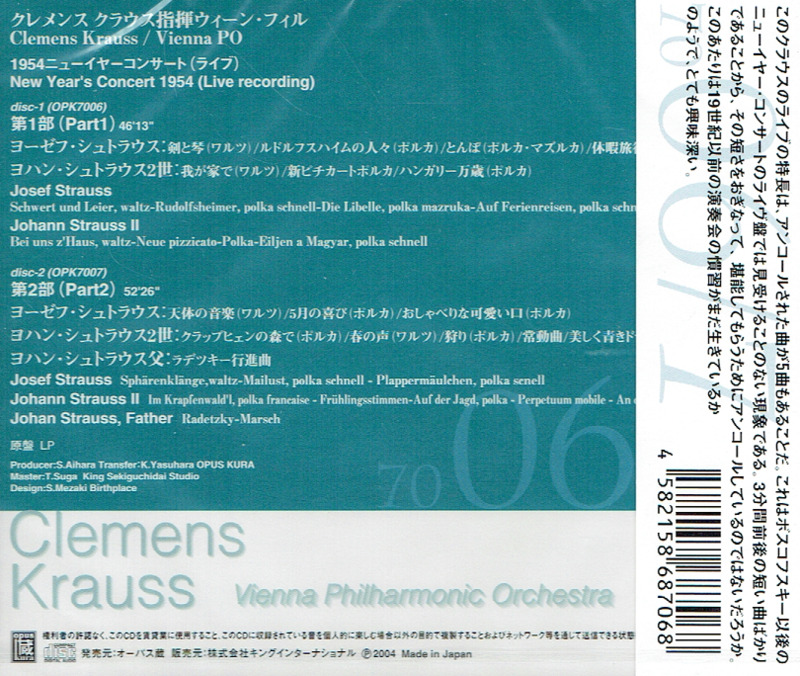 He also conducted the premiere of Strauss' anti-War cantata FRIEDENSTAG. After the Munich opera house was bombed, shutting it down, he returned to conduct the Vienna Philharmonic Orchestra until it closed shortly before the end of the War (1944-45). After the War, Allied officials investigated his pro-Nazi activities and because of them forbade him from appearing in public until 1947. Notably, however, they also found that he had frequently acted to assist a number of individual Jews escape the Third Reich machine. When his ban was lifted he resumed frequently conducting the Vienna Philharmonic, including its famous New Years Day concerts. He conducted at Covent Garden in London (1951 to 1953) and in the 1953 Bayreuth Festival [whose RING of that season is famously notable]. He was married to the soprano Viorica Ursuleac. He was in Mexico on vacation when he died there in 1954."